When you go to San Francisco, don't just take photos of the Golden Gate Bridge. Experience it! Drive to the Presidio. You have probably heard of Lombard Street, the most famous street in San Francisco, so drive west onto Lombard Street and enter the Presidio from there. You will see the sign at the gate, "Established 1776". The Presidio has more than 200 years of military history - from Spanish years, Mexican years and American years. You will immediately see brick buildings and on a clear day, the top of the Golden Gate Bridge. You will pass a cluster of brick buildings, where the Disneyland Museum is located. Skip the Disneyland Museum and find Lincoln Blvd. There are many road constructions under the Marina Blvd highway as of this writing. Watch for signs of detour. Just make sure to stay on Lincoln Blvd towards Crissy Field. It is okay though to get lost in the Presidio. If you are lost, you would be lost in the Presidio forest. Park your car. Enjoy the trees planted in the 1800's by the Army, like Monterey pines and cypress, blue gum eucalyptus, etc. The forest provides habitat for nesting birds, so you might even see some beautiful birds like red-tailed hawks and pygmy nuthatches. You will likely end-up exiting the Arguello entrance or heading towards the Golden Gate Bridge. However, try to find Lincoln Blvd heading towards Crissy Field and Long Avenue. And this is my best kept secret: there's plenty of free parking when you get there. Park your car. Then start your hike. First, stretch your legs out and warm-up at Crissy Field. Oops you are not a serious hiker but a serious photographer. You have an IPhone5 in your pocket and a Nikon D600 hanging on your neck. Perfect! Stand at the Fort Point Pier for you will have an unobstructed view of the Golden Gate Bridge, the Alcatraz and the San Francisco Bay. Oh, you have seen these views from many postcards and travel magazines, so you go back into hiking. You forgot your bottled water. Do not worry! There is Warming Hut Café and bookstore at the foot of Fort Point Pier where you can get water, drinks, sandwiches, soups and salads inspired by locally grown and produced foods. However, you are not hungry, you just want water. There are restroom facilities in another building outside of the Warming Hut Café. Turning left from the restroom facilities, you will see Long Avenue. Cross Long Avenue and you will see steps heading towards Battery East Trail. Just a warning! The hike from Fort Point pier to the Golden Gate Bridge is quite strenuous. 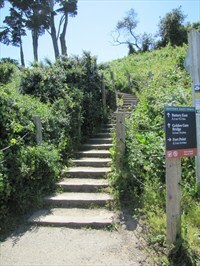 Take the steps; it will take you to Battery East Trail. You will take a few ascending steps and see beautiful wild flowers, red and golden poppies before reaching the Golden Gate overlook. You will pass different loops and vantage points for taking pictures from another perspective of the spectacular bridge. You will pass the Fort Point National Historic Site. You might want to stop and read on the information about the bridge and the history of Fort Point. After reading and perhaps after taking pictures from this vantage point, you want to continue your hike. Watch out for bikers. The San Francisco Bicycle Route 202 merged onto Battery East Trail. Then continue on to Golden Gate Bridge. It could get windy and cold on the bridge, so you should have the proper outfit. Read the warning signs before walking the bridge. For example, the Battery East Trail is part of the GGNRA (Golden Gate National Recreation Area) and dogs are not allowed on the GGNRA, but there are exceptions to the rules. You will have to share the bridge walkway with bikers and many tourists taking pictures. You will not admit it, but you are one of them. You will pull out your camera and take pictures of the spectacular views of San Francisco, like the city skyline and the Alcatraz. You finally walk across the bridge, and you are now on the Marin side. You will linger around Vista Point for, in there, you will be able to take pictures of the Golden Gate Bridge from different perspectives. However, the San Francisco skyline competes for your attention. After taking thousands of pictures, you finally go back into hiking. You just notice the warning sign from the Marin side of the bridge. It's okay, you already took a thousand pictures. Now you can concentrate on walking. You follow the Battery East trail to go back down to Fort Point and the Warming Hut Café. You have just hiked six miles and have taken plenty of photos of one of the world's most breathtaking views. Enjoy a latte or cappuccino and coffee (they're organic) and a California sandwich, and check out the Warming Hut Café souvenir shop. The money you spent at the shop helps the National Park System. An Illusion "Jules Among the Crowd"